Paved Driveways: 4 Good Reasons to Request This Home Improvement! A concrete paved driveway remains the “gold standard” for accessing a residential property, of course. Today, many realty buyers won’t consider purchasing a home without this feature. Maintaining a gravel or dirt driveway in a usable condition simply requires too much time and effort for most modern households. Plus, over time the cost of periodically re-applying depleted driveway gravel, sand or stone really adds up! The popular Zillow.com website allows consumers to track online estimated real estate values for states and cities in the United States. It recently forecast an increase in average residential realty values in our state of 4.7% during the coming year. Many people in the Raleigh area regard home ownership as one of the most important means of ensuring the financial security of their families. Maintaining easy access to this important asset remains a basic concern. You require the capability to reach your residence dependably during every season of the year in order to fully enjoy owning your property. In this respect, installing a permanent paved driveway usually offers greater peace of mind. Paved driveways offer a second very fundamental advantage. Unlike loose stone or gravel surfaces, they don’t pose a significant risk of causing dings to the exteriors of parked vehicles. When cars travel through a gravel-covered area, loose material sometimes dislodges from the roadway and slams into adjacent automobiles. Flying gravel may cause cracks and bullseye abrasions on auto windshields and windows. Even worse, this material sometimes scratches or dings glossy finishes. If you own multiple vehicles, regularly using a driveway covered with loose aggregates instead of concrete may eventually contribute to automotive window glass or surface repair bills over the course of time. It often requires more frequent car washing, too. By contrast, concrete drives seem tailor-made for vehicles and drivers. These surfaces typically withstand years of heavy, regular use. They can support heavy trucks and vans reliably. While you will need to resurface a concrete driveway eventually, this process generally won’t hinge upon the severity of last year’s winter weather (unlike gravel driveway maintenance). Plus, if you ever do need to quickly eyeball the condition of axles, undercarriages or tires, you’ll find this process much easier to undertake on a level concrete surface. Paved driveways offer another benefit for homeowners. If you maintain a lawn adjoining your driveway, the process of mowing it usually becomes a little easier once you switch from a loose aggregate or dirt drive to a concrete one. Why? 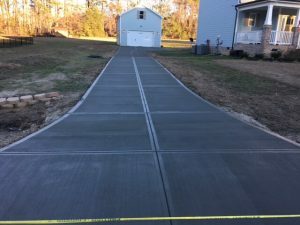 Probably the strongest reason to consider installing a concrete paved driveway involves augmenting the overall ambiance of the property, however. You’ve probably noticed how well maintained a home appears following the construction (or resurfacing) of a lovely paved surface. You can mentally preview this change simply by imagining several different houses in your neighborhood after they have undergone this transformation. Today, some full-time concrete installers (like We Do Concrete Cheap) assist property owners by providing a variety of available concrete textures and surfaces. We offer mixing and staining services to create drives in a variety of exciting tones. Choose popular gray shades, or white, yellow, red, umber, or black hues. We’ll help you match the appearance of your driveway to complement residential masonry, for instance. Our company specializes in customizing concrete improvements to help Raleigh homeowners achieve their individual design goals. Have you decided to order the installation of a new paved driveway in the Greater Raleigh, North Carolina Area? We Do Concrete Cheap excels in helping implement this important property improvement. 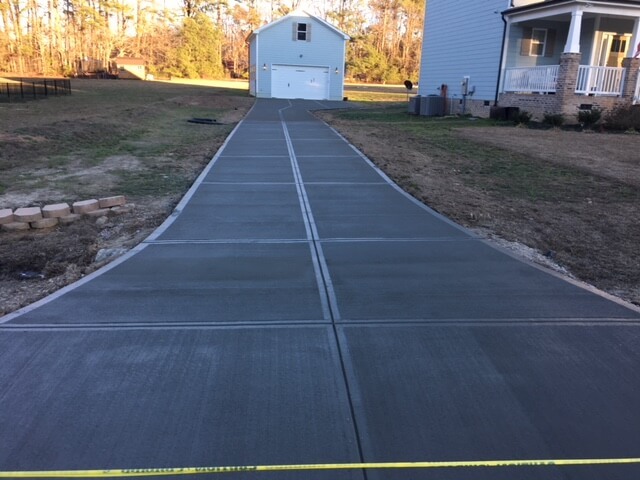 We possess the experience and specialized tools required to construct attractive, durable concrete drives outside residential and business locations. We offer affordable rates and fast, skilled service!